Gerie Owen is a test architect with a major electric utility company in the Boston area. She has 25 years of experience as a testing manager, and is currently coordinating testing activities among multiple projects and defining testing strategies and processes. Gerie has written a number of articles for testing publications, including SearchSoftwareQuality.com and STPCon. She has been interviewed on cognitive biases testers face in finding software bugs by StickyMinds. Gerie speaks often at international conferences on software testing, Her topics have been accepted at over a dozen different conferences, including StarCanada, Belgium Testing Days, and QA&Test, and her talks have been well-received by her audiences. Gerie's blog, Software Testing in the Trenches, can be found here. Gerie lives in the Boston area, and travels frequently to conferences and user group meetings. 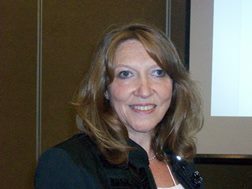 Gerie Owen at the Conference of the Association for Software Testing.